Baltimore Sun‘s Jeff Zrebiec recently brought up the battle to start next to C.J. Mosley at inside linebacker for the Baltimore Ravens in 2017, and one name to keep an eye on is veteran Albert McClellan. 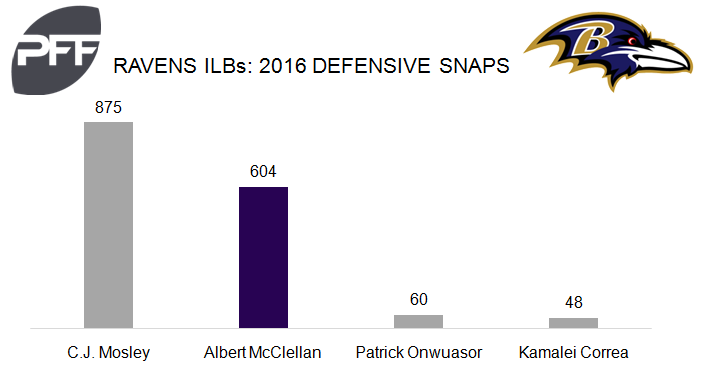 McClellan is a core special teams player in Baltimore, but also played 604 snaps on defense in 2016, with time spent as an edge defender and inside linebacker. McClellan’s best season came in 2012, when he stood out against the run and posted a PFF grade of 76.7, splitting time between edge defender and inside linebacker. McClellan’s grade of 42.3 in 2016 was the lowest of his career; he struggled to generate much as a pass-rusher, with just four total pressures on 147 pass-rushing snaps bringing his overall grade down. His main competition for the starting job will come from second-year linebacker Kamalei Correa and Patrick Onwuasor, who combined for just 108 snaps on defense in 2016.